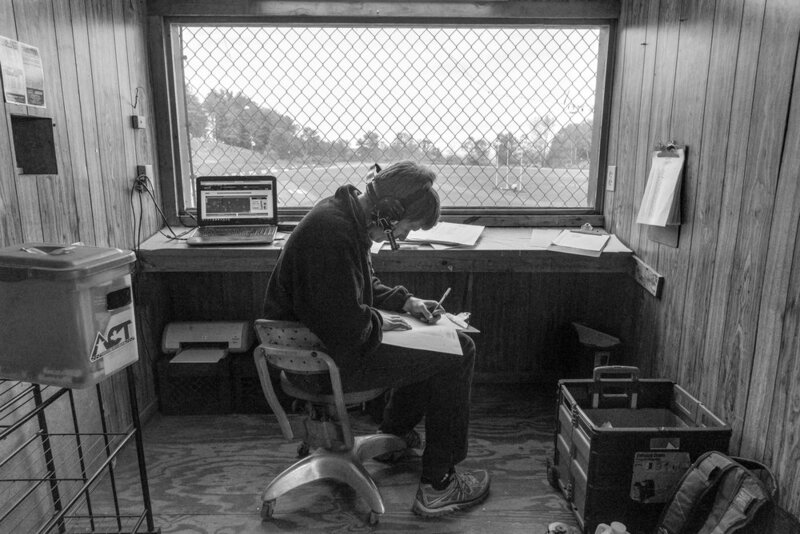 Photographs made while working as a Staff Photographer for the Barre-Montpelier Times Argus in Vermont. 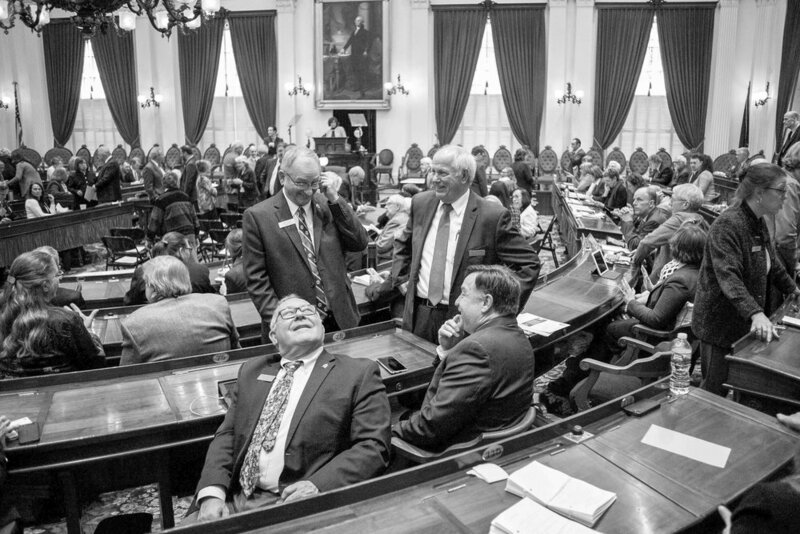 On April 17th, 2018, Vermont Speaker of the House Mitzi Johnson (pictured center) samples one of retiring representative David Sharpe's (D-Addison 4, pictured left rear) neckties on Senator Randy Brock (pictured left, R-Franklin). Sharpe is retiring at the conclusion of this year's session, and is selling numerous themed neckties he has worn throughout his legislative career to benefit Friends of the State House. William Bridwell releases extra large bubbles into the crowd during the annual All Species Day Parade in Montpelier's Hubbard Park on May 6th, 2018. Representatives mingle before Governor Phil Scott delivers the fiscal year 2019 budget address in the House Chamber of the Vermont State House on Tuesday, January 23rd 2018. The Barre Fire Department responds to a propane tank explosion and fire on May 5th, 2018 at Northern Power Systems. Keene Swamp Bats outfielder Alex Carballo (Junior; Pembroke Pines, FL / Kennesaw State) is tagged out by Mountaineers catcher Tanner Gallman (Sophomore; Calhoun, GA / Georgia State) on July 10th, 2018. Montpelier Parks & Trees ECO AmeriCorps member Emily Markstein of Burlington receives training from North American Training Solutions (N.A.T.S) in Hubbard Park on Tuesday, December 19th 2017. N.A.T.S worked with several trainees in the park on work positioning and advanced climbing techniques. Snow removal efforts continue into the night in the shadow of the Vermont State House in Montpelier on Sunday, January 7th 2018. Members of Migrant Justice, a Vermont organization that advocates for migrant workers in the state join with hundreds of Vermonters in protesting U.S. Immigration policy at the State House in Montpelier on June 25th, 2018. Spaulding senior forward Isaiah Browman reaches for a rebound against visiting Rice at Spaulding High School in Barre on Tuesday, February 13th 2018. Derek Bartlett clears the sidewalk on Main Street in Barre on Tuesday, January 9th 2018. Warmer temperatures finally allowed Bartlett to finish clearing ice from previous storms during the cold snap. A Montpelier firefighter emerges from a house fire on Main Street with a frightened cat on Tuesday, January 2nd 2018. All tenants were evacuated safely but several pets did not survive. Representative Peter Welch (D-VT) and Senator Patrick Leahy (D-VT) share a moment on May 1st, 2018 after the completion of a press conference at Morse Farms in East Montpelier to highlight opposition to an FDA proposal to require an "added sugar" label on pure maple syrup. The Barre Figure Skating Club holds a dress rehearsal for their annual show at the B.O.R Ice Arena on Sunday, February 11th 2018. Blue Mountain Union's junior Annie Dennis (L) battles Arlington junior Kierstyn Hess (R) for a loose ball at the Barre Auditorium on Monday, March 5th 2018. Noah Ladensack of Duxbury wows the crowd with a wheelie during the annual Not Quite Independence Day Parade in Waterbury on June 30th, 2018. 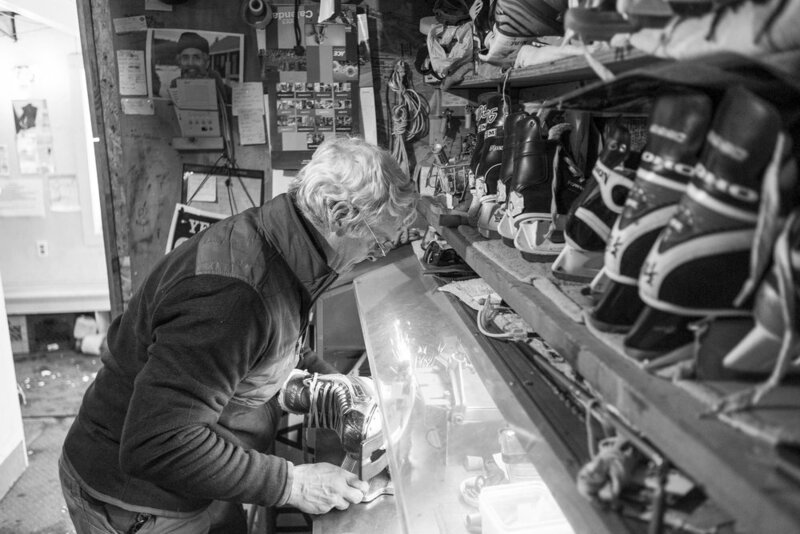 Operations Manager John Townsend of Essex Junction sharpens ice skates at "The Skatium" in Waitsfield on Tuesday, December 26th 2018. Capitol Police officer Dale Manning snaps an ID photo of new Legislative Page Linnea Colwell of Montpelier as the State House prepares for the 2018 legislative session on Tuesday, January 2nd 2018. 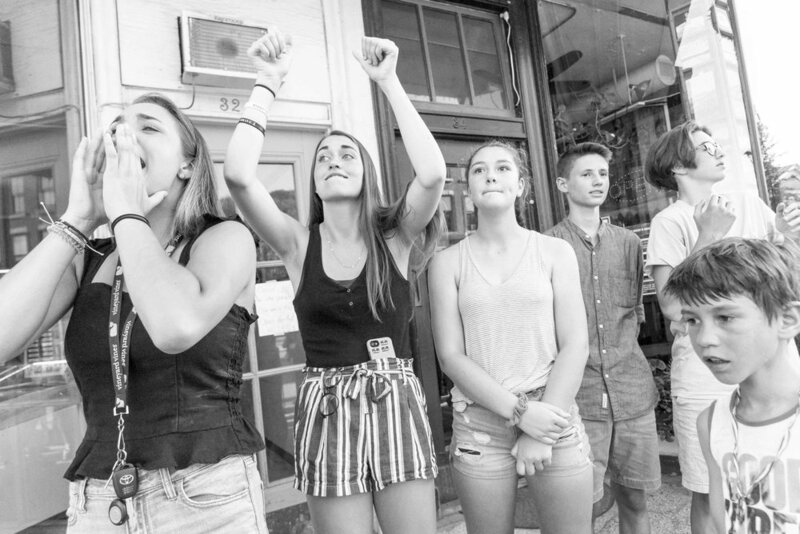 Young fans of Bernie Sanders cheer on the Senator during the Independence Day Parade in Montpelier on July 3rd, 2018. Vermont State Police officers gather after fatally shooting Nathan Giffin on the athletic fields at Montpelier High School on Tuesday, January 16th 2018. Giffin robbed at gunpoint the Vermont State Employees Credit Union adjacent to the school, where he was once a student. After a nearly-hour long standoff, during which Giffin made suicidal statements and threats, eight state troopers and one Montpelier Police officer opened fire, alleging that he moved toward them with the weapon. The weapon turned out to be a BB-gun. 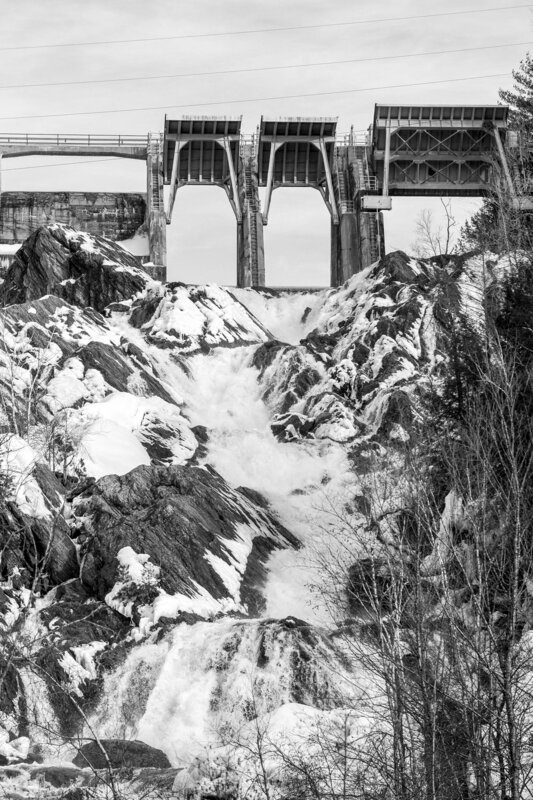 The Winooski River flows through the Waterbury Dam in Little River State Park on Sunday, January 28th, 2018. Kale Barberi of Marshfield talks with his son Gavin, 4, as groups opposed to new gun legislation, donning blaze orange apparel, turned out in high numbers to attend public hearings at the State House on Tuesday, January 30th 2018. 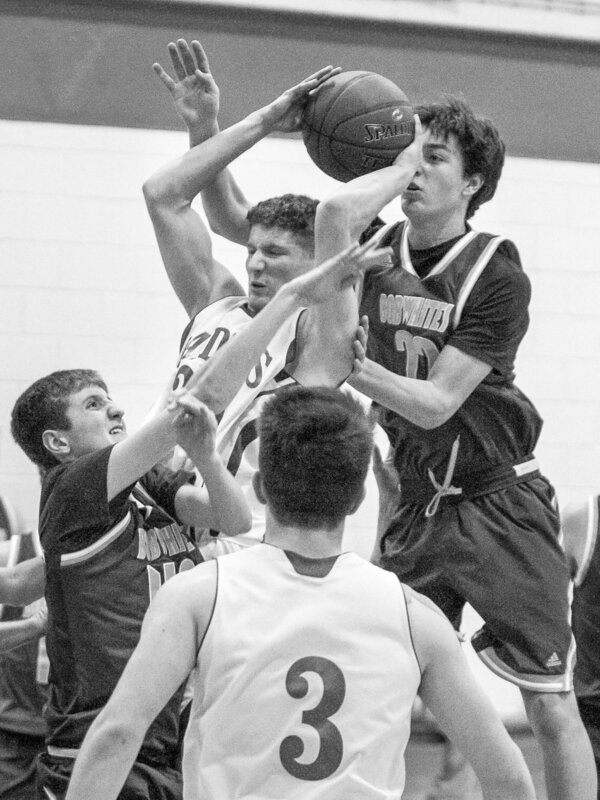 U-32's senior guard Josh Farber secures an offensive rebound through heavy traffic against visiting BFA St. Albans on Tuesday, January 9th 2018. Narin Phanthakhot of Colchester successfully completes a "clean and jerk" lift at Green Mountain Crossfit in Barre during their annual "Lift Up!" Fundraiser on Saturday, January 20th 2018. Norwich University Sophomore forward Taeron Lewis leads an offensive charge against visiting Hobart College on Saturday, January 20th 2018. Participants gather around a bonfire during the conclusion of Ice on Fire, a winter festival held at the North Branch Nature center in Montpelier on Sunday, February 4th 2018. Eagles fans chant the Eagles' victory song at Langdon Street Tavern in Montpelier as Patriots fans pack up and leave following Philadelphia's first Super Bowl victory on Sunday, February 4th 2018. BFA St. Albans' Mark Howrigan (L) sends Spaulding's Tyler Murray (R) into the boards at the B.O.R Ice Arena in Barre on Monday, February 12th 2018. 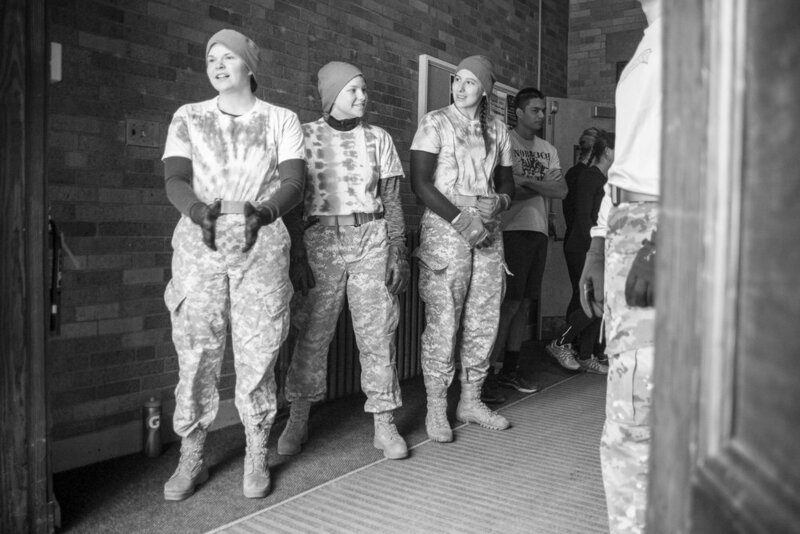 Norwich Cadets partake in the 2018 Brian Bill Memorial Challenge on the Norwich campus in Northfield on April 8th, 2018. Bill was a 2001 Norwich graduate and Navy SEAL who was killed in Afghanistan in 2011. Patrick Hayes of Wadmalaw Island, South Carolina, loses his hat while making the most of his northern visit sledding at Hubbard Park in Montpelier on Sunday, February 11th 2018. 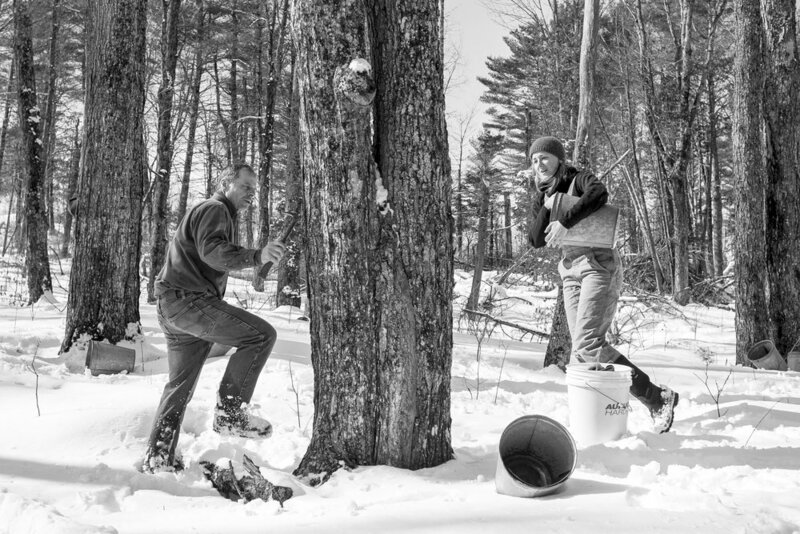 Dan Bragg (L) and Grace Pease (R) of Bragg Farm tap sugar lines in East Montpelier on Monday, February 19th 2018. Employees were working an area that was about 14 of the 70 total acres Bragg Farm will tap in the 2018 season--about 2200 buckets total. Kermit O'Meara of Orange laughs with a bandmate between songs at the Moose Club in Williamstown on Sunday, March 4th 2018. Worcester residents gather at the Doty Memorial School gymnasium for Town Meeting on Tuesday, March 6th 2018. Luke Groom, 14, of Waitsfield, fires a slapshot through snow showers at The Skatium on Tuesday, December 26th 2017. 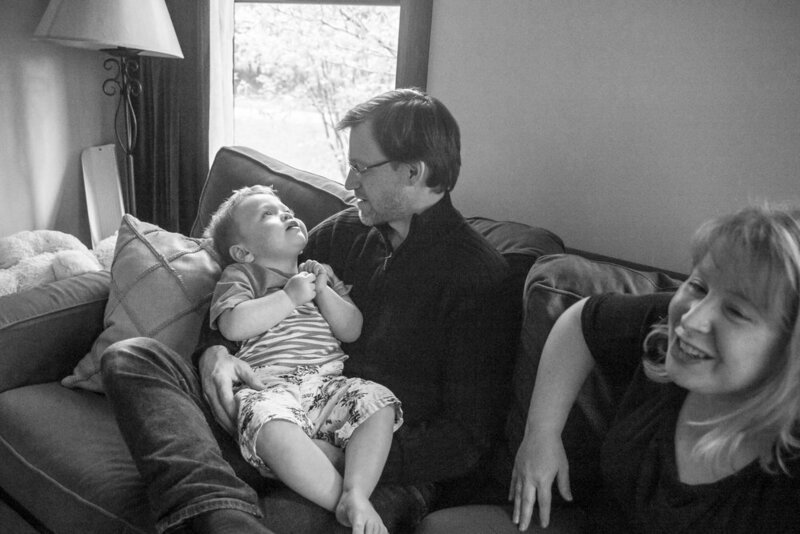 Rowan Smith is held by his father Jeremy at their East Montpelier home on May 15th, 2018. The Smith family is suing the city of Montpelier over emergency ambulance coverage necessary to respond quickly to Rowan's needs, who suffers from chronic seizures and breathing problems. Elementary school students from Montpelier and Calais march from the Kellogg-Hubbard Library down State Street to the State House on Sunday, December 10th 2017. Students were protesting possible resource exploitation of the Alaskan Arctic National Wildlife Refuge included in the U.S. Senate tax bill. Traffic on Main Street in Montpelier crawls along as Vermont is hit with the 2017-2018 winter's first significant snowfall on Tuesday, December 12th 2017. Spencer Pryce, a 1996 U-32 graduate, shares a moment with his daughter Zoe, 4, after the 25th annual Kris Kemp Alumni Hockey Games at the Central Vermont Memorial Civic Center on Tuesday, December 26th 2018. Skiers take advantage of fresh snow at Mad River Glen in Waitsfield on Tuesday, December 26th 2017. Senator John Rodgers (D-Essex-Orleans) urges Governor Phil Scott to "fulfill his campaign promises" and veto the gun control measures in S.55 during a presser at the State House in Montpelier on April 10th, 2018. Rodgers also apologized for his remarks on the floor the previous week, saying it was not his intention to be divisive. Chris Hancock, a 3-year Rec Center player, watches on during an afternoon pickup game at the Montpelier Rec Center on April 16th, 2018. Vermont State Police's Colonel Matthew Birmingham answers questions at a press conference on April 17th, 2018 in Montpelier, held to divulge the details and conclusion of the state's investigation into David Giffin's police shooting death at Montpelier High School in January. 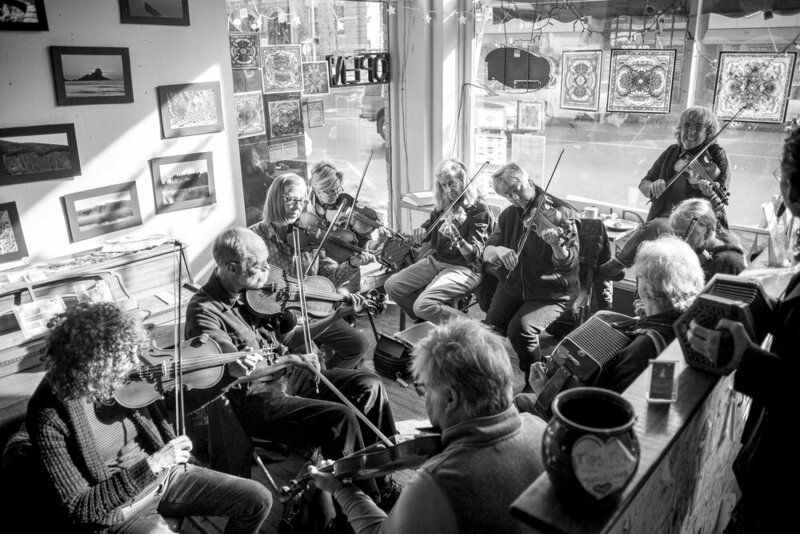 Local musicians gather for a Swedish Jam Session at Bagitos Cafe in Montpelier on Sunday, January 28th 2018. Jim and Jeanne Gricci of Northfield share a laugh with Sen. Bernie Sanders on May 19th, 2018 during a Veterans town hall and resource fair at Norwich University. Tyler Andrews of Concord, MA finishes first (2:17:44) and is assisted by medical staff at the 30th People's United Bank Vermont City Marathon in Burlington on May 27th, 2018. Cows run through a pasture in Calais along Max Gray Road on June 3rd, 2018. A Cross Country skier for U-32 High School pushes through the cold as the sun sets during a race at Morse Farms in Montpelier on Tuesday, February 13th 2018. Gabriela Calderon and Latisha Montgomery look up and embrace during a student-led ceremony to raise the Black Lives Matter flag on the U-32 flagpole on June 4th, 2018. Camel's Hump mountain looms over Barre at sunset on Sunday, February 18th 2018. U-32 celebrates their Division Two Championship victory over GMVS at UVM on June 9th, 2018. Severe storms approach Montpelier from the west on June 18th, 2018. Different hues of blue and green are seen at the granite quarries in Graniteville on June 26th, 2018. Behind the scenes at the 56th annual Memorial Day Classic at Thunder Road in Barre on May 27th, 2018. U.S.S. Montpelier sailor JD Smith (left) hands a miniature American flag to Miss Vermont, Julia Crane, during the Independence Day Parade in Montpelier on July 3rd, 2018. Protestors gather near Police Headquarters on December 13, 2014. Weeks of protest followed a Staten Island grand jury's decision on December 3rd 2014 not to indict Officer Daniel Pantaleo in the killing of Eric Garner. Protestors march through SoHo on December 13, 2014. Apartment residents look below to the demonstrations on Houston street on November 25th 2014, after a grand jury failed to indict Ferguson police officer Darren Wilson in the killing of Michael Brown. Protestors march east on Houston Street on November 25th 2014, after a St. Louis grand jury chose not to indict Ferguson Police Officer Darren Wilson in the killing of Michael Brown. Demonstrators spill onto FDR drive at Houston street on November 25th 2014, blocking traffic in both directions in protest of a St. Louis Grand Jury decision not to indict Officer Darren Wilson. Protestors weave through traffic on FDR Drive on November 25th, 2014 following a St. Louis grand jury's decision to not indict Officer Darren Wilson. 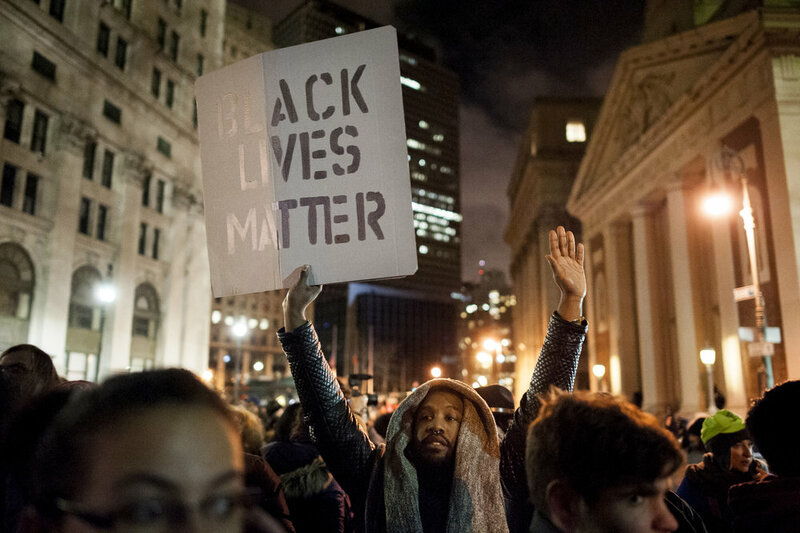 Protestors march through manhattan after a St. Louis grand jury chose not to indict Ferguson Police Officer Darren Wilson in the killing of Michael Brown. Constance Malcom marches with other demonstrators in Manhattan following a St. Louis grand jury's decision not to indict Ferguson police officer Darren Wilson. Malcom's son Ramarley Graham was killed under disputed circumstances by NYPD narcotics officer Richard Haste, who never faced charges. Patrons of an Irish Pub on 36th street react to protestors on the street below on December 5th, 2014. Weeks of protest followed a Staten Island grand jury's decision on December 3rd 2014 not to indict Officer Daniel Pantaleo in the killing of Eric Garner. A taxi driver shouts at demonstrators as they block 7th avenue in Manhattan. A passenger on an MTA bus reacts to the November 25th 2014 protest of a St. Louis grand jury's decision not to indict Officer Darren Wilson in the killing of Michael Brown. 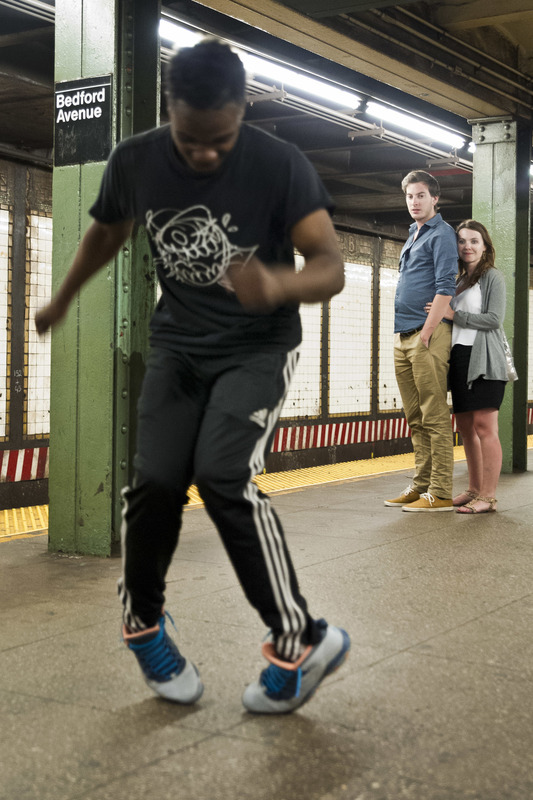 Bus passengers look on during a demonstration on December 5th, 2014. Weeks of protest followed a Staten Island grand jury's decision on December 3rd 2014 not to indict Officer Daniel Pantaleo in the killing of Eric Garner. 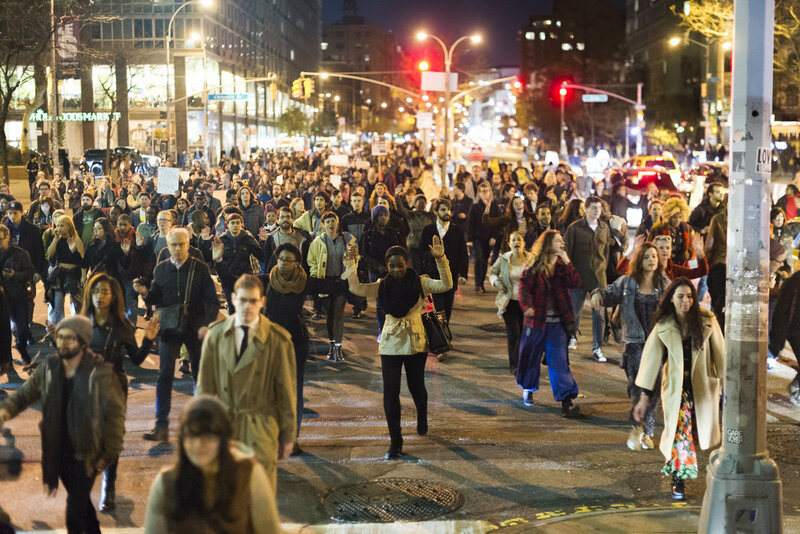 Demonstrators march on 34th street near Penn Station on December 4th, 2014. Weeks of protest followed a Staten Island grand jury's decision on December 3rd 2014 not to indict Officer Daniel Pantaleo in the killing of Eric Garner. Demonstrators bring traffic at the Lincoln Tunnel entrance to a standstill on December 4th, 2014. Weeks of protest followed a Staten Island grand jury's decision on December 3rd 2014 not to indict Officer Daniel Pantaleo in the killing of Eric Garner. Demonstrators block the entrance the the Lincoln Tunnel on December 4th, 2014. Weeks of protest followed a Staten Island grand jury's decision on December 3rd 2014 not to indict Officer Daniel Pantaleo in the killing of Eric Garner. Demonstrators gather in the rain in the middle of Times Square on December 6th, 2014. Weeks of protest followed a Staten Island grand jury's decision on December 3rd 2014 not to indict Officer Daniel Pantaleo in the killing of Eric Garner. Demonstrators confront a driver who was attempting to break through a protest on December 4th, 2014. Weeks of protest followed a Staten Island grand jury's decision on December 3rd 2014 not to indict Officer Daniel Pantaleo in the killing of Eric Garner. Demonstrators block traffic in Times Square on December 6, 2014. Weeks of protest followed a Staten Island grand jury's decision on December 3rd 2014 not to indict Officer Daniel Pantaleo in the killing of Eric Garner. Demonstrators assemble at the Target inside the Atlantic Terminal shopping center on December 8th, 2014. Weeks of protest followed a Staten Island grand jury's decision on December 3rd 2014 not to indict Officer Daniel Pantaleo in the killing of Eric Garner. Demonstrators overwhelm the Toys 'R' Us in Times Square on December 6th, 2014. Weeks of protest followed a Staten Island grand jury's decision on December 3rd 2014 not to indict Officer Daniel Pantaleo in the killing of Eric Garner. 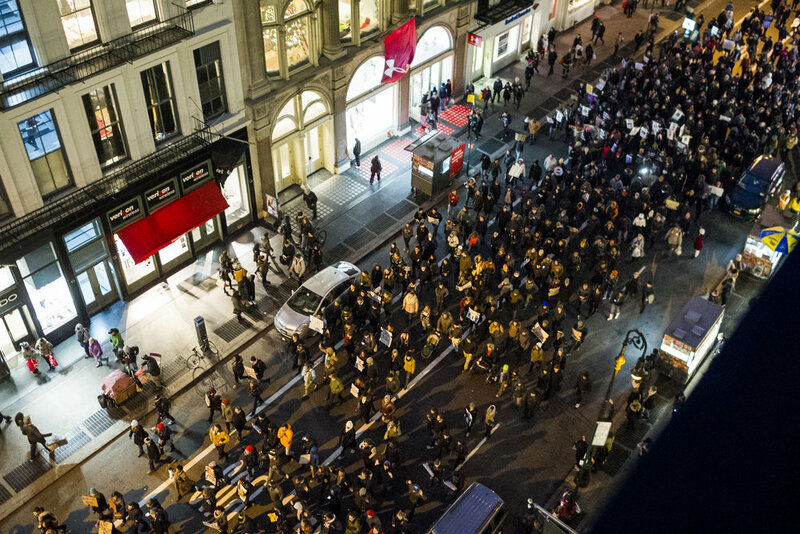 Demonstrators march through multiple floors of Forever 21 in Times Square on December 6th, 2014. Weeks of protest followed a Staten Island grand jury's decision on December 3rd 2014 not to indict Officer Daniel Pantaleo in the killing of Eric Garner. Demonstrators swarm the Disney Store in Times Square on December 6th, 2014. Weeks of protest followed a Staten Island grand jury's decision on December 3rd 2014 not to indict Officer Daniel Pantaleo in the killing of Eric Garner. A line of police awaits an oncoming demonstration on the West Side Highway on December 4th, 2014. Weeks of protest followed a Staten Island grand jury's decision on December 3rd 2014 not to indict Officer Daniel Pantaleo in the killing of Eric Garner. Demonstrators confront police outside the Atlantic Terminal shopping center on December 8th, 2014. Weeks of protest followed a Staten Island grand jury's decision on December 3rd 2014 not to indict Officer Daniel Pantaleo in the killing of Eric Garner. An NYPD officer looks on as FDR Drive is shut down by demonstrators on November 25th, 2014 following a St. Louis grand jury's decision to not indict Officer Darren Wilson in the killing of Michael Brown. 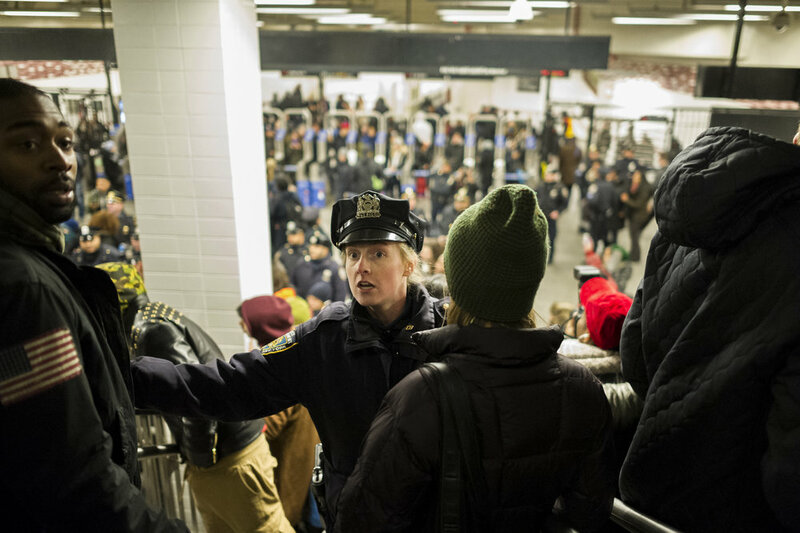 Police push back a line of demonstrators at the Barclays Center subway station on December 8th, 2014. Weeks of protest followed a Staten Island grand jury's decision on December 3rd 2014 not to indict Officer Daniel Pantaleo in the killing of Eric Garner. 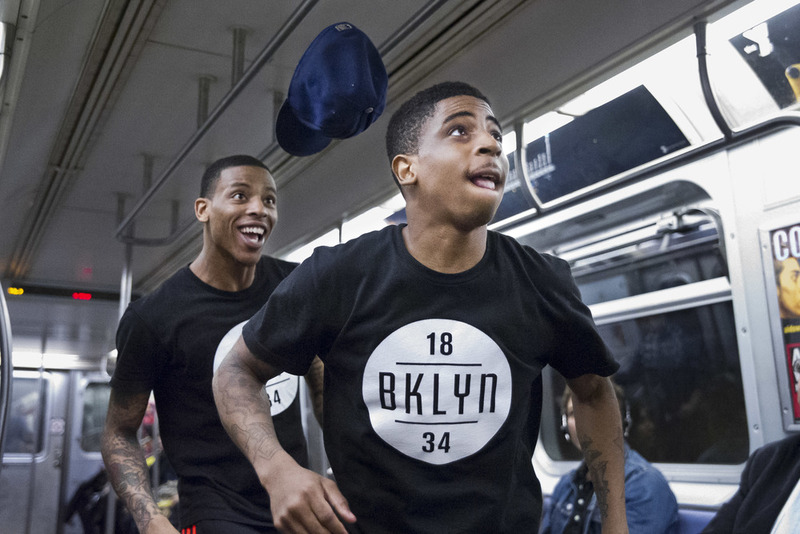 Tensions finally snap between police and protestors at the Barclays Center subway station on December 8th, 2014. Weeks of protest followed a Staten Island grand jury's decision on December 3rd 2014 not to indict Officer Daniel Pantaleo in the killing of Eric Garner. Dozens of NYPD officers forcibly arrest a demonstrator on December 8th, 2014, after separating him from a crowd at the Barclays Center subway station. Weeks of protest followed a Staten Island grand jury's decision on December 3rd 2014 not to indict Officer Daniel Pantaleo in the killing of Eric Garner. Demonstrators re-enact the killing of Eric Garner, shouting "I Can't Breathe!" in the main atrium of Grand Central Station on December 6th, 2014. Weeks of protest followed a Staten Island grand jury's decision on December 3rd 2014 not to indict Officer Daniel Pantaleo in Garner's killing. Demonstrators gather and speak in the center of the main atrium in Grand Central on December 6th, 2014. Weeks of protest followed a Staten Island grand jury's decision on December 3rd 2014 not to indict Officer Daniel Pantaleo in the killing of Eric Garner. An NYPD officer looks on from above as demonstrators take part in a "die-in" in the main atrium of Grand Central Station. Weeks of protest followed a Staten Island grand jury's decision on December 3rd 2014 not to indict Officer Daniel Pantaleo in the killing of Eric Garner. 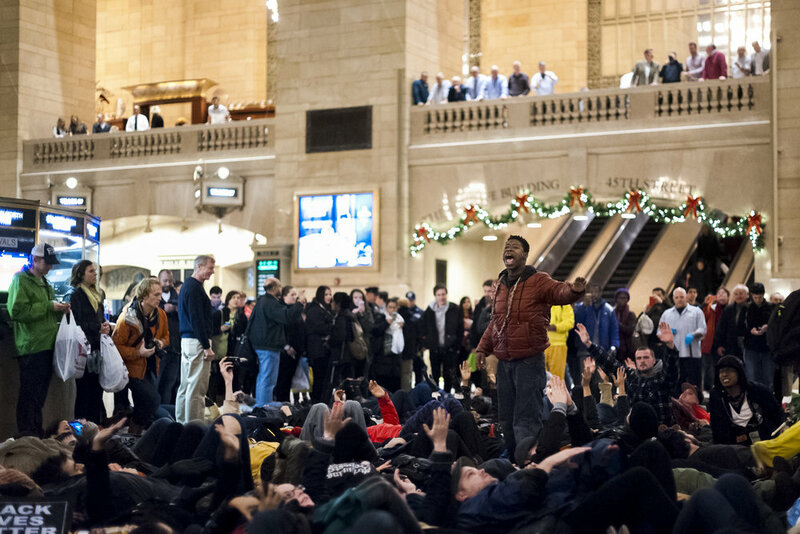 Demonstrators take part in a "die-in" in the main atrium of Grand Central Station on December 6th, 2014. Weeks of protest followed a Staten Island grand jury's decision on December 3rd 2014 not to indict Officer Daniel Pantaleo in the killing of Eric Garner. Media gather in the lobby of the Manchester Radisson hotel. A campaign office for Republican candidate Donald Trump sits mostly empty in downtown Manchester. Despite the lack of a traditional ground organization, Trump won the state easily. Republican Candidate Ted Cruz at the Red Arrow Diner in Manchester, NH. 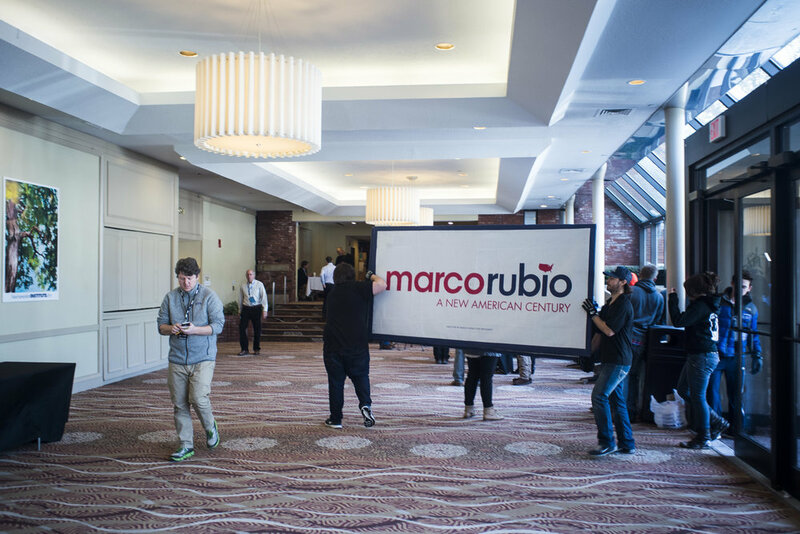 Campaign staff carries in signage for Senator Marco Rubio (R-FL) into the Manchester Radisson. Waiting for Democratic candidate Bernie Sanders to speak at the University of New Hampshire in Durham. Secret Service surveys the venue before the candidate enters. 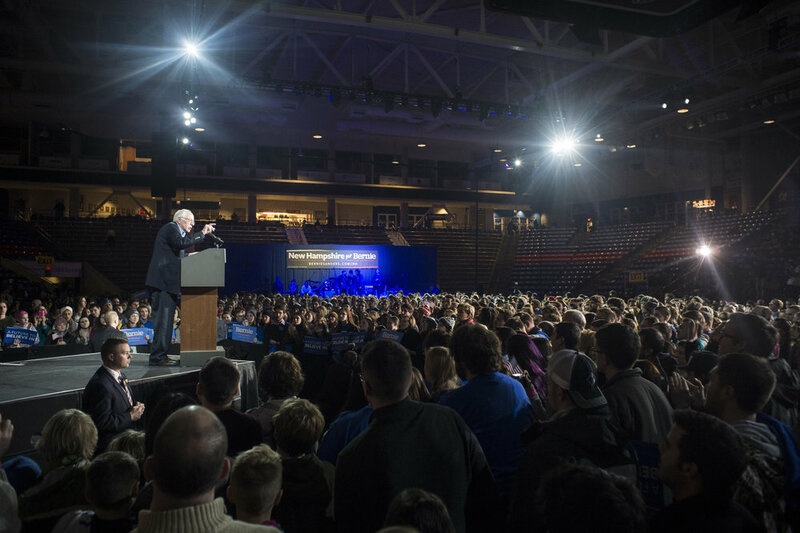 Senator Bernie Sanders (I-VT) addresses the crowd at the University of New Hampshire. Sanders won every county in the state. Senator Sanders raises his arms in disbelief over the specter of student debt on millenials. Senator Sanders stays after his speech to shake hands with the crowd. Sanders bids farewell to the crowd. Sanders supporters head through the snow back to the parking lot following the rally. 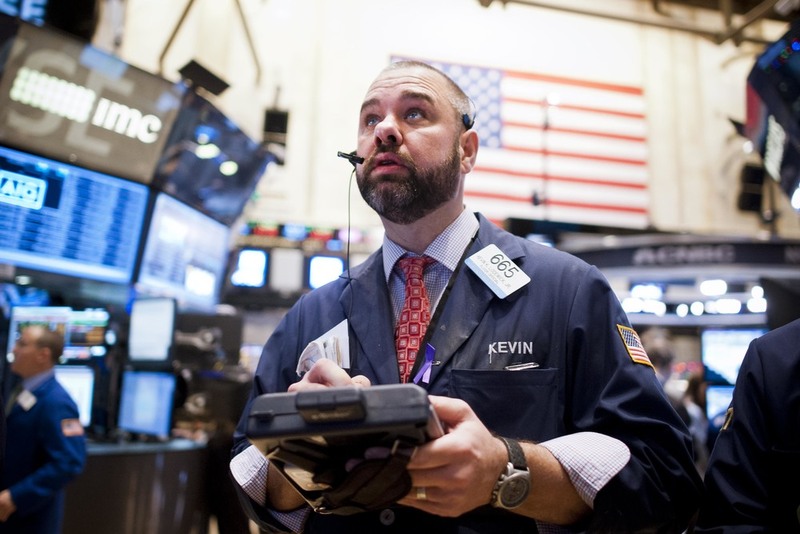 New York Stock Exchange, 2014. 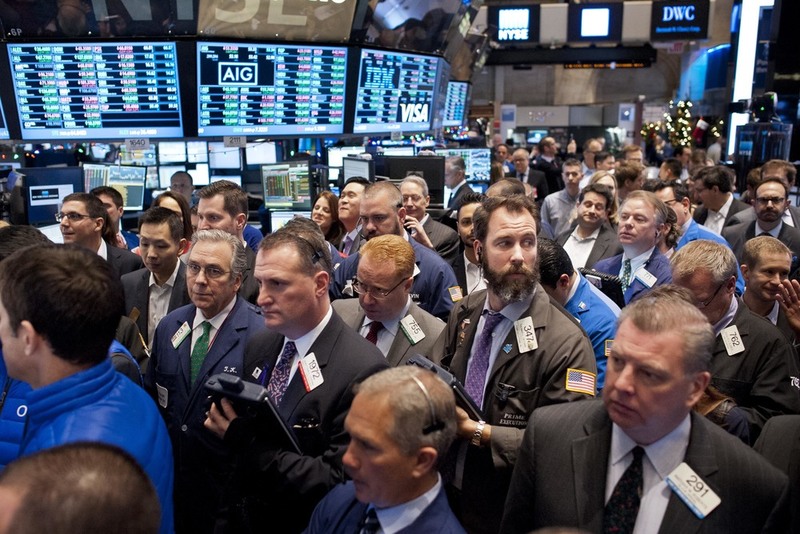 The NYSE floor slowly floods as OnDeck begins its initial public offering on December 17, 2014. 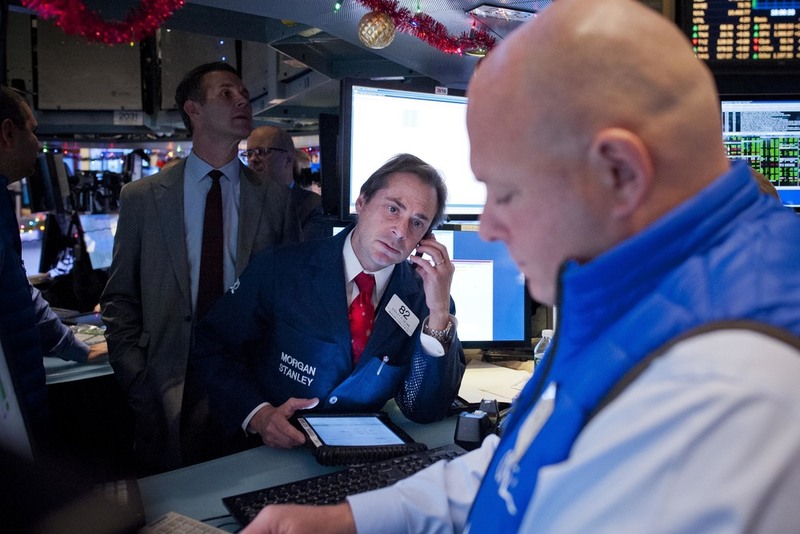 Kevin Lodewick places orders during OnDeck's initial public offering on December 17, 2014. Fred DeMarco of Baycrest Partners, LLC monitors the markets during OnDeck's initial public listing on Decmeber 17, 2014. KCG's Michael O'Connor relays pricing information during OnDeck's initial public offering on December 17, 2014. Dudley R. Devine of Morgan Stanley, an underwriter for OnDeck's initial public offering, remains in contact as the stock opens for the first time. Barclays' Joseph Mastrolia remains alert during OnDeck's initial public offering on December 17, 2014. 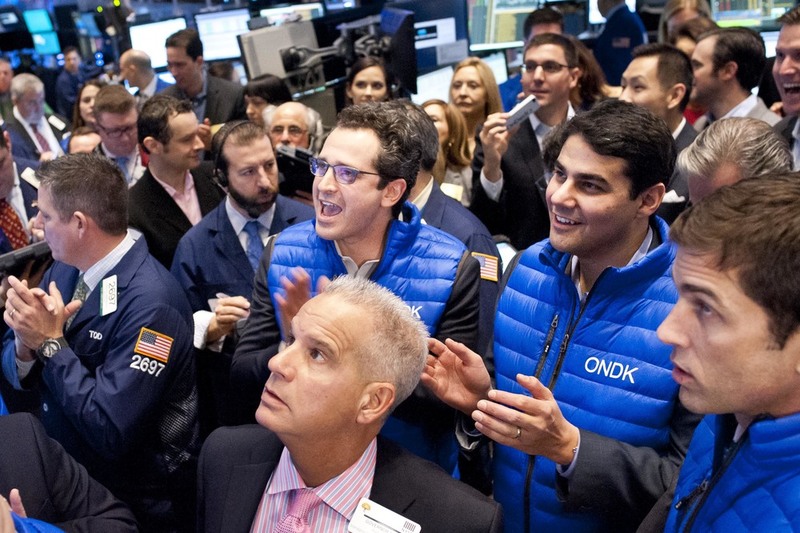 OnDeck CEO Noah Breslow (left) and CFO Howard Katzenberg (right) cheer on as their stock opens on December 17, 2014. OnDeck CEO Noah Breslow strikes the First Trade Bell as his company officially begins trading under the ticker symbol ONDK. Peter Tuchman of Quattro M. Securities, Inc., jokes with OnDeck executives as the company begins its first day of trading on December 17, 2014. OnDeck employees celebrate as their company's stock debuts at $20.00 per share, rising to $27.98 by the end of its first day of trading. Migrant Workers, Whately, MA 2012. Peter tends to the irrigation tractor at dawn. Peter waits out a sudden downpour in the irrigation tractor. Workers gather at dawn outside their dormitory, waiting for a bus that will take them to one of several farms in the Western Massachusetts area. Western Massachusetts migrant workers wait to be bused to area farms for the work day. 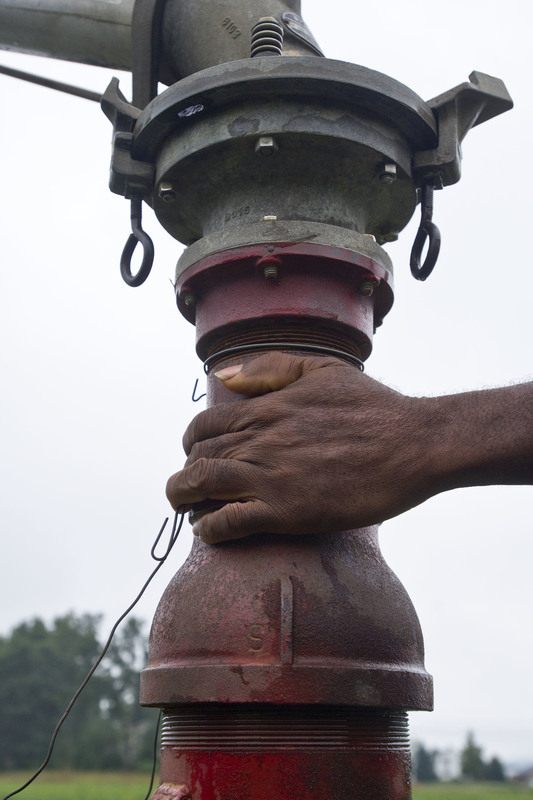 Peter stabilizes the irrigation pump. 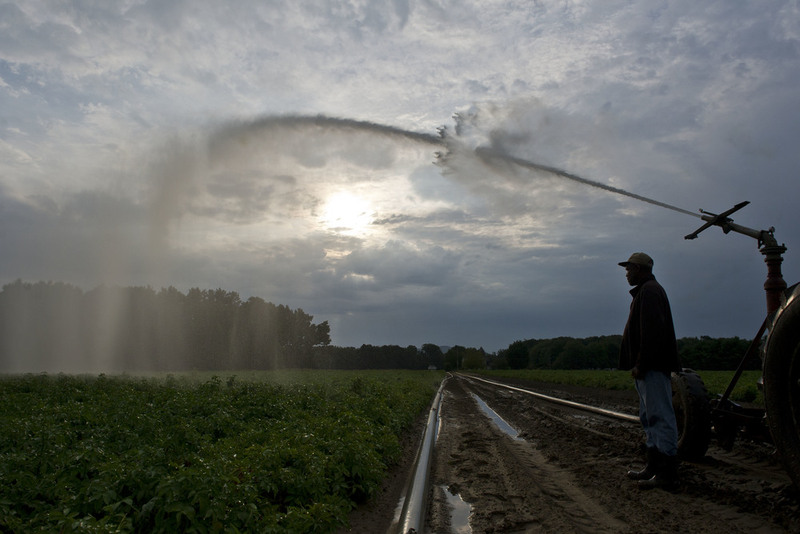 A rainbow forms from the irrigation process. Done with work for the day, a communal meal and traditional Jamaican spirit are prepared for the whole dormitory. Migrant workers eat, stretch, and relax after a day's work. Much of the free time workers have is spent on the phone with their families back home. Cooling off in front of a fan, a worker calls home to his family. Christian Skateboarders, Rochester, NY 2011-2012. A Skateboarder launches off a ping pong table at the Crossroads Youth Center in Spencerport, NY after worship services. The Youth center provides a combination of Christian education and skateboarding, with a barn that has been converted to an indoor, outdoor extreme sports park. A skateboarder from the Crossroads Youth Center rides in downtown Rochester with scripture adorning the bottom of his board. A skater enjoys a quick smoke before Bible Study. Kids making up the congregation on Sunday stretch and yawn through a sermon after a night out. Two skaters horse around in downtown Rochester before getting back in the Pastor's minivan at the end of the day. A skater shields his face from an incoming ping pong ball during a game of "sting pong" at the Youth Center, after some visibly successful hits. A skater enjoys an electronic cigarette. Youth Center members film and release a skateboarding video every year. A solo video editing session at the Youth Center. Kids who need a ride home from the Center on weekdays wait in the Pastor's minivan after Bible Study. 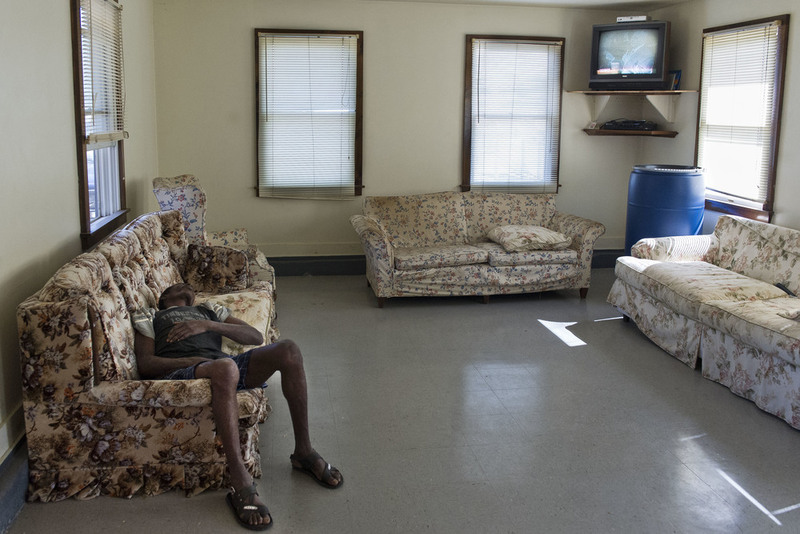 Crossroads Youth Center stays open into the night for kids to enjoy the facilities as long as they like.